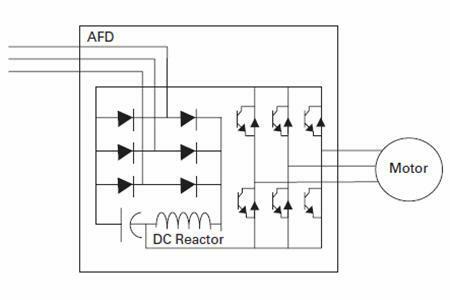 Assuming an AFD with a six-diode input bridge, and no line reactor, DC choke, or filter applied, IEEET 519 1992 guidelines may not be met even if the total connected AFD loads are less than 10%. Because many AFDs require a minimum 1–3% input impedance, the AFD requirements may not be met without a line reactor or additional impedance. This is simply a series inductance on the DC side of the semiconductor bridge circuit on the front end of the AFD. In many ways, the DC choke is comparable to an equivalent AC-side line reactor, although the %Total Harmonic Distortion (THD) is somewhat less. The DC choke provides a greater reduction primarily of the 5th and 7th harmonics. On higher order harmonics, the line reactor is superior, so in terms of meeting IEEE guidelines, the DC choke and line reactor are similar. If a DC choke (or line reactor) is applied on all AFDs, it is possible to meet IEEE guidelines where up to 15% to 40% of system loads are AFDs, depending on the stiffness of the line, the amount of linear loads, and the value of choke inductance. A harmonic analysis is required to guarantee compliance with guidelines.